The holidays and consumerism go hand in hand, so why not make the season (and your tots) bright by teaching kids about money. Mudpuppy’s Money Banks go two steps beyond saving for a rainy day. Each bank features three labeled slots in which to make a deposit: spend, share and save. Little ones may be introduced to the concepts of purchasing and keeping money in the bank, as well as what it means to be charitable. Banks are made with a minimum of 70% recycled paper and are printed with nontoxic, soy-based inks. A color coordinated padlock with two keys gives tots easy access to their small fortune. Designs range from robots, outer space and pirates to gardens, ballerinas, carousels and butterflies. *Enter Coupon Code ZZZ2 at checkout for 15% off any purchase from the Mudpuppy website. The holidays and consumerism go hand in hand, so why not make the season (and your tots) bright by teaching kids about money. Mudpuppy's Money Banks go two steps beyond saving for a rainy day. Each bank features three labeled slots in which to make a deposit: spend, share and save. Little ones may be introduced to the concepts of purchasing and keeping money in the bank, as well as what it means to be charitable. Banks are made with a minimum of 70% recycled paper and are printed with nontoxic, soy-based inks. 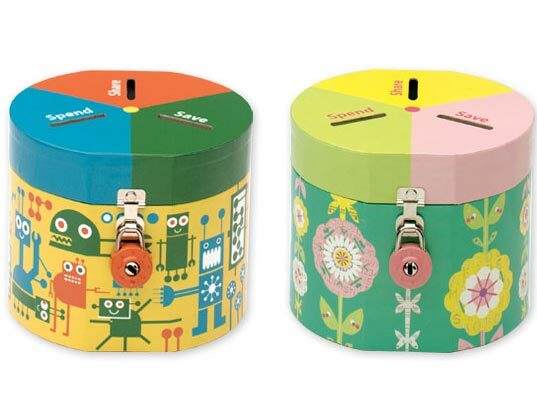 A color coordinated padlock with two keys gives tots easy access to their small fortune. Designs range from robots, outer space and pirates to gardens, ballerinas, carousels and butterflies.